GeeekNET ESP32 Development Board is made with the official WROOM32 module. There is built in USB-to-Serial converter, automatic bootloader reset, Lithium Ion/Polymer charger. And just about all of the GPIOs brought out so you can use it with any sensor. That module contains a dual-core ESP32 chip, 4 MB of SPI Flash, tuned antenna. And all the passives you need to take advantage of this powerful new processor. The ESP32 has both Wi-Fi and Bluetooth Classic/LE support. That means it's perfect for just about any wireless or Internet-connected project. The ESP32 is a perfect upgrade from the ESP8266 that has been so popular. In comparison, the ESP32 has way more GPIO, plenty of analog inputs, two analog outputs, multiple extra peripherals (like a spare UART), two cores so you don't have to yield to the Wi-Fi manager, much higher-speed processor. Please note: The ESP32 is still targeted to developers. Not all of the peripherals are fully documented with example code, and there are some bugs still being found and fixed. We got it working under Arduino IDE, so you can expect things like I2C and SPI and analog reads to work. And also we got it working under MicroPython, so you can test it with the command line console, it will be nice to programmer. But other elements are still under development. For that reason, we recommend this module for makers who have some experience with microcontroller programming, and not as a first dev board. 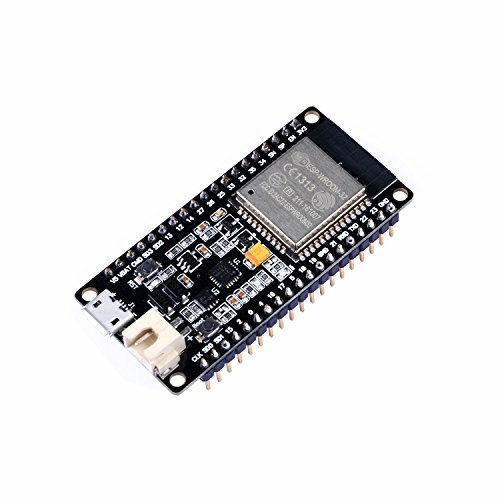 GeeekNET ESP32 Development Board is made with the official WROOM32 module. Module contains a dual-core ESP32 chip, 4 MB of SPI Flash, tuned antenna. Both Wi-Fi and Bluetooth Classic/LE support. Perfect upgrade from the ESP8266 that has been so popular. If you have any questions about this product by seeed studio, contact us by completing and submitting the form below. If you are looking for a specif part number, please include it with your message.